Welcome back, my Groovy Ghoulies! Ol' Groove is once again dipping deep into his museum of the macabre to bring you the most spine-chilling comicbook tales of the 1970s. This time around, we're looking at the always-wholesome Archie Comics Group's entry into the eerie, Red Circle Sorcery. Back? 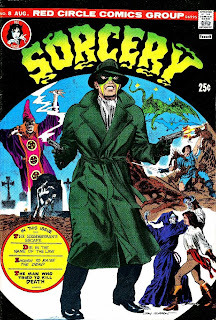 Okay then, now that you know all about how even the Archie folks tried to cash in on the creepy and cookie supernatural craze of the early 70s, let's take a look at a couple stories from Ol' Groove's very most favorite issue of RSS, the legendary issue #8 (May, 1974)! Author Channing was on a roll this ish. Here he teams up with the master, Alex Toth, for "The Man Who Tried to Kill Death!" Red Circle, riding the horror wave of the 70s was short and sweet. Lots of great artists. Loved the first few issues because they were pretty much Gray Morrow one man shows. Have you ever seen Gray Morrow's comics work from the '50s? Nice drawing & much less reliance on photo reference. He fell into the trap of using it for everything by the early '70s & it stiffened up his,figure drawing somewhat. No, I haven't. Where would be a good place to find his 50s work? I like his work in the very early issues of Creepy. Ah, Alex Toth, what a master! Happy Birthday, Groove! Thank you for maintaining your site, it's a shining oasis of comics coolness! Long may it continue! Yes, the Northridge character is clearly based on photo reference of Alex Toth. Love it! Happy 10th, Groove. Enjoyed this week's 'retro' posts - as I do pretty much everything else you post. Wow, a whole decade of Groovy Diversions, didn't it just seem to fly by? Thanks for all the great comics Groove, I wonder how many years it will take until you've posted every comic printed in the glorious Groovy Age of comics?